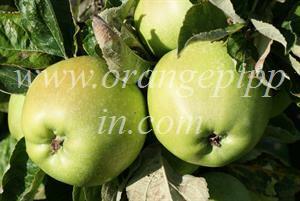 Lord Derby is a traditional large English cooking apple, ripening in the mid-season - early September. It remains a popular apple variety in English gardens, and is a good choice if you are looking for an apple tree for the garden as an alternative to Bramley which can be used in the period from September to November. Lord Derby is quite easy to identify, on account of its large size, bright green colours and ribbed shape. The Victorian author Hogg rates it as an "excellent culinary apple". The flavour is nicely acidic if picked young, but milder if picked when fully ripe (at which point the skin develops a more yellow hue). 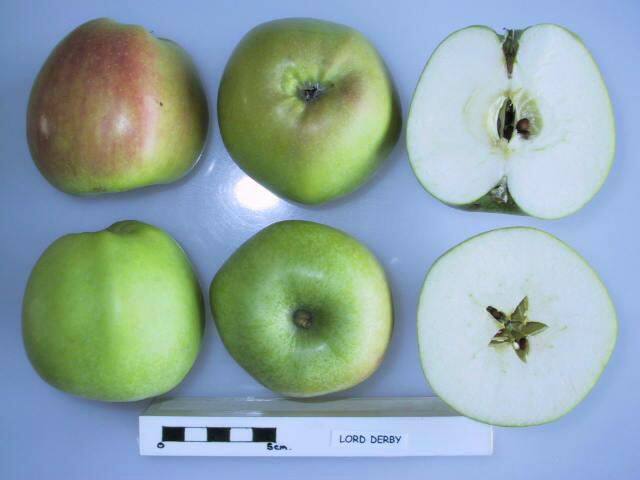 Like many Victorian cooking apples, it has naturally good disease resistance. I've had a Lord Derby apple from a pup!!!!! Don't agree with the comments on taste. It is very good when baked, and used for apple tart. Because of the short keeping time I usually core peel chop and freeze it. However, I find that keeping some in the refrigerator helps to keep it longer. We inherited a large old tree 10 years ago which was identified as Lord Derby at an apple day in Cumbria. After 3 years of professional pruning it has proved well worth saving. Here it breaks down well on cooking and is very good in cakes. Brown rot and mice mean it only lasts until January. Mice leave alone any wrapped in news paper. A large old apple tree (70 to 80 years or more)in our garden has been identified at the Apple Day festival at the National Botanic Gardens of Wales as the variety 'Lord Derby'. It does cook very well and as long as plentty of sugar is added has good flavour when cooked. It also crops very well, and 2011 was an exceptionally bumper year, but even in this wet year we have had a reasoanble crop it usually stores for 3 to 4 months in the garden shed provided the mice don't cause too much damage. It does soon turn yellow but still seems OK when stewed. I think this is the variety I have and I agree that it is quite a bland taste and doesn't fall well when cooked. However, it is a prolific fruiter and I have trained it to keep it compact. Going to use this year's crop with the addition of some Bramleys to make cider. We inherited an apple that has been identified as Lord Derby and is certainly large and green, turnng yellowish when ripe. Unfortunately, we find it virtually tasteless whether raw or cooked, and it does not form any kind of puree when cooked, but remains in slices. Any suggestions?